This is a description of the frames table of the frame camera raster type with a list of supported fields. A frame camera refers to a single perspective imaging camera with an optical lens that can be modeled as a pinhole. The frame camera raster type allows you to manage frame camera imagery in a mosaic dataset. For information about the frames table schema in ArcGIS Pro 2.1, see the supplemental help documentation. The frames table contains the camera exterior orientation information that is specific to each frame, such as frame camera image path, perspective X, Y, and Z coordinates, and omega, phi, and kappa values. The table format can be a geodatabase table, a feature class table, or a .csv file. You can also use the Build Frames & Cameras Tables tool to create the frames table in a guided process. The supported frames table fields are listed below. Note that a parameter definition in the frames table takes precedence over any duplicate definitions in the cameras table. The unique number identifier for each image. The primary key identifying the camera parameters. This must match the CameraID value from the cameras table for the corresponding camera. 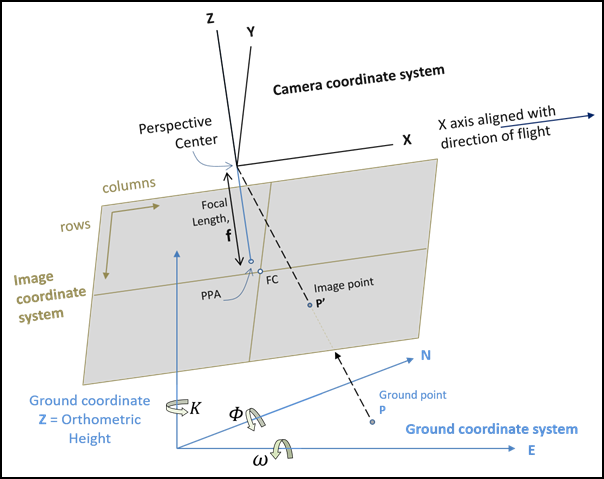 The x-coordinate of the perspective center in the ground coordinate system. The units are in the coordinate system units. Geographic coordinate system units are not supported. Specify the PerspectiveX value in projected coordinate system units. The y-coordinate of the perspective center in the ground coordinate system. The units are in the coordinate system units. Geographic coordinate system units are not supported. Specify the PerspectiveY value in projected coordinate system units. The z-coordinate value of the perspective center in the ground coordinate system. The z-coordinate units should be consistent with the x- and y-coordinate units. The z-coordinates are typically expressed as orthometric heights, which means elevation above sea level. This is appropriate if you'll be inputting a DEM that is also using orthometric heights. If you have z-coordinates that are using ellipsoidal heights, your DEM should also be in ellipsoidal heights. When z-units are ellipsoidal and the DEM is orthometric, the Geoid flag can be used to enable an approximate correction. The rotational angle of the camera's x-axis in degrees. The units are in decimal degrees. The rotational angle of the camera's y-axis in degrees. The units are in decimal degrees. The rotational angle of the camera's z-axis in degrees. The units are in decimal degrees. The matrix describing the transformation from image space to map space. The matrix is specified as nine floating-point values, which are delimited by spaces or semicolons. The polygon identifying the region containing valid image data. This polygon becomes the footprint of the corresponding mosaic dataset item. An alias name to identify the image. If this is left blank, the image file name is used. A tag that enables the image to participate in a function template. An optional categorization for images. All images with the same group name participate together in a function template. The coordinate system associated with the perspective point as a file path or WKID (EPSG code). For EPSG code, the coordinate system for x,y and z are separated by a semicolon (;), for example 26918;5773. If not defined, it defaults to the data-specified or mosaic dataset SR. The spatial reference can be defined for each image item in the mosaic dataset as well. If the SRS field is defined both in the cameras table and the frames table, the value in the frames table will take precedence. The format is value pairs separated by semi colons, for example, "106000.0 -106000.0;-106000.0 -106000.0;-106000.0 106000.0;106000.0 106000.0". Values of 1, 2, 3, or 4 where 1 represents X_Right_Y_Up, 2 represents X_Up_Y_Left, 3 represents X _Left_Y_Down, and 4 represents X_Down_Y_Right. The ID number of a strip (run). Required*—The frames table must have either the Omega, Phi, and Kappa fields or the Matrix field for the data to be added to the mosaic dataset. If both types of EO exist in the table, the transformation matrix value will be used. A frames table stored as a geodatabase table is shown below, where only a selection of the available fields are being used. Since four frames (images) are used in this example, there are four rows in the table.